Superstar Floyd Mayweather Jr. didn’t think enough of Danny Garcia’s performance against Robert Guerrero (33-4-1, 18 KOs) to give him any more than a 12 round draw last Saturday night in his world title at the Staples Center in Los Angeles, California. Fortunately, for Garcia, Mayweather was not one of the judges for the fight. The judges gave Garcia the win by the scores of 116-112, 116-112 and 116-112. That comes out to an eight rounds to four score. Mayweather thinks Garcia was loading up too much and not using his boxing skills the way that he needed to. The fans didn’t like the holding and movement that Garcia was using throughout the fight. 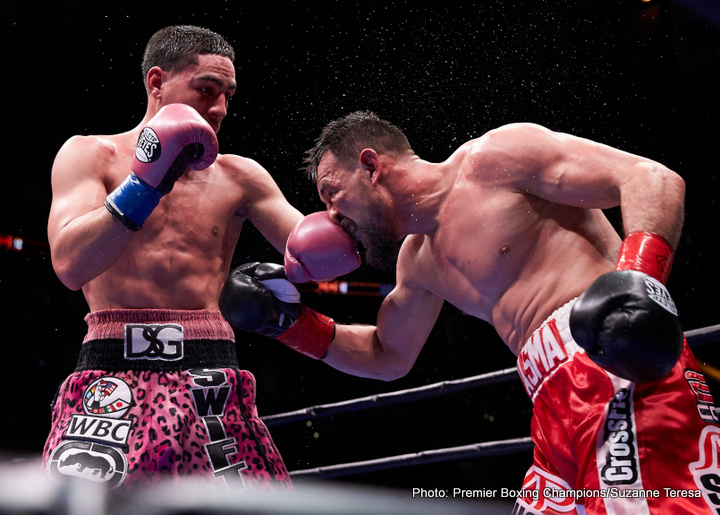 While Garcia had talked about wanting to make it an entertaining fight for the fans, he gave the opposite type of performance in the fight by choosing to hold and run most of the fight. It was not a Gennady Golovkin-esque type of fight by Garcia. If was more like watching Guillermo Rigondeaux fight, but with a lot less skill than Rigondeaux. In other words, Garcia fought like a poor man’s version of Rigondeaux in my view. “It was cool. I had it a draw. It was a little closer [than the judges scored it]. You still got to realize that Danny, for a fighter that’s undefeated, he’s young,” Mayweather said to Fighthype. “From what I saw, Robert won the early rounds. Danny Garcia won the middle rounds. Robert kind of came on in the last two rounds. It was kind of close, but it’s boxing. I think Danny needs to work on more boxing, not just depending on power shots. He’s the new WBC world welterweight champion. He’s a world champion now and I’m proud of him,” Mayweather said. Guerrero fought really well in the first half of the fight. It was like watching how he fought against Andre Berto in 2012. Guerrero really took the fight to Garcia and had him looking a little shell-shocked. The fight changed course in the last half of the fight when Guerrero stopped pressuring as hard, and the pace of the fight slowed to a level that Garcia liked. Garcia then was able to dominate the action when Guerrero wasn’t putting the pressure on him. In the 12th round, Guerrero woke up and started putting heavy pressure on Garcia again and he fought well enough to win the final round. “They only gave Guerrero four rounds? I had it a lot closer, 7-5, 6-6,” Mayweather said. “I understand we need to have a lot more judges that aren’t biased, but Danny went out there and did what he had to do. I’m not taking anything away from him like I have anything negative to say about Danny Garcia, but I thought the fight was a lot closer. I’m not the judge and it’s not in my hands. I’m proud of whoever won, and Danny Garcia is a very exciting fighter, and a very hungry fighter, and he went out there and did what he had to do,” Mayweather said.